Maretron's FFM100 provides precision fuel flow information to help optimize fuel consumption, which can save thousands of dollars in fuel operating cost. The FFM100 uses state-of-the-art, positive displacement metering technology for unprecedented accuracy. In fact, the accuracy of the FFM100 is nearly that of commercial vessel systems costing tens of thousands of dollars, yet the FFM100 cost less than existing recreational systems found on the market today. Additional benefits of the positive displacement metering technology are the elimination of flow conditioning components such as straighteners and pulsation dampers. Other flow meter technologies require flow conditioning components that increase system and installation cost. The FFM100 also uses true temperature compensation with embedded temperature sensors within the meters. The returning fuel is generally hotter than the supply fuel and if not properly compensated, inaccuracies as much as 5% can occur in computing the engine's fuel consumption. The FFM100 also detects momentary reverse flow in the fuel lines due to fluctuating pressure caused by the injection pump. Less accurate systems count the reverse fuel flow as part of the consumed fuel where the FFM100 properly accounts for momentary reverse flow. Lastly, the FFM100 can be used for fluid types other than fuel (e.g., water, oil, etc.) by ordering the appropriate flow sender. The FPM100 is NMEA 2000® certified so you can view any and all information anywhere on the vessel using a compatible NMEA 2000® display. 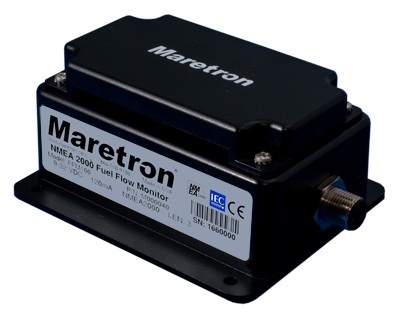 The FFM100 is a key component of Maretron's N2KView® vessel monitoring and control system.